Captain George L. Thompson acted bravely while helping to rescue his crew, but when he watched his ship the Pere Marquette 16 sink, he burst into tears. Car Ferry Pere Marquette 16 was already considered a “hard luck” ship when she collided with the pier in Ludington harbor, but as far as 33 of her crew members were concerned, she was lucky in encountering the Ludington Life Saving crew. The Pere Marquette first was known as the Shenango 2, then the Muskegon, and then Car Ferry Pere Marquette 16. Finally, as the “hard luck” car ferry, she ran into some good life saving luck as well as the 13 foot pier as she attempted to enter the harbor at Ludington, Michigan the stormy Saturday night of December 22, 1901. At this point in her nautical life, the Pere Marquette 16 had passed through as many stages and transitions as a Lake Michigan storm. Built in 1895 by the Craig Shipbuilding Company of Toledo, Ohio, she was a wooden ship, 282 feet long and carried 26 cars. She was known as the Shenango 2 and the Muskegon when she sailed under the registration number of US 116695. In 1897, the Detroit, Grand Rapids and Western Railroad bought her to operate as a car ferry between Muskegon and Milwaukee. After the Michigan railroad consolidation of 1899, the Muskegon was moved to Ludington and her name changed to Pere Marquette 16. The Pere Marquette 16 had made numerous trips across the Lake to Ludington, Michigan before that fateful Saturday in December, and successfully cleared the Ludington North Breakwater Light. In December 1901, light keeper Adam N. Weckler had been at his post about 16 months, since August 14, 1900. The Pere Marquette Harbor Lifesaving Station had been established in 1871, and Keeper Weckler had efficiently trained his crew and other volunteers, training that was soon to make the difference between life and death for the 33 crewmembers on Pere Marquette 16. The government equipped each lifesaving station with a breeches buoy and cart, and standard beach rescue drills of the time featured men or horses pulling a cart down the beach. The cart held a Lyle gun, line, powder for the gun, and a breeches buoy. Captain David A. Lyle, a graduate of West Point and Massachusetts Institute of Technology invented the life-saving Lyle gun that could throw a line to a stranded ship, an invention that saved the lives of countless sailors. Once the line reached the ship, shore crews sent out breeches buoy equipment to the stranded people on the ship. The drill ended with bringing back “victims” in the breeches buoy. In actual rescues, line-throwing guns like the Lyle and breeches buoys were used for ships wrecked within 600 yards of shore while lifeboats performed long distance rescues. Lifesaving crews held beach rescue drills once every week to maintain their peak of readiness. The lifesaving crew at Ludington had been discharged for the winter in December of 1901, but they and volunteer lifesavers were instrumental in the rescue. The men were Berndt Carlson, William De Young, George Robinson, Peter Carlson, Levi Schroder, Oscar Wilkinson and John Nelson. Captain George L. Thompson had once again skillfully guided his vessel across Lake Michigan from Milwaukee, with the assistance of his officers and crew. A.T. Dority served as his mate; S. Brownell, second mate; Ernest Heald, purser; Samuel Sylvester, chief engineer; and George Van Brunt, assistant engineer. The Pere Marquette carried a full cargo of twenty-six loaded cars, ten of them filled with perishable goods valued at $12,000 and the ship itself was valued at $165,000. As Captain Thompson steamed closer to Ludington, the wind velocity increased until it reached about forty miles an hour and towering seas from the south buffeted the Pere Marquette. Captain Thompson enjoyed a long-term relationship with the Great Lakes. He had moved from his birthplace in Ogdensburg, New York to Detroit when he was a young boy and received his education in the public schools of Detroit, Saginaw and Port Huron. After he left school in 1877, he took a job with the Northwest Transportation Company and served as a watchman of the passenger steamer Quebec. He honed his seamanship on various Lake vessels, including the Colorado and Roanoke on which he served as master. In 1897 he became Master of the ferry steamer Shenango 2, later the Musekgon, later the Pere Marquette 16. Captain Thompson’s experience told him that he would have to run his ship directly in the troughs of the waves to enter the Ludington piers, but he believed he could bring her safely into the harbor as he had done so many times before. This time, despite his experience and intimate knowledge of the lakes, Captain Thompson miscalculated. The Pere Marquette 16 had safely reached Ludington Harbor, but before she could safely tie up to the pier, the waves snatched her from Captain George L. Thompson’s control. The waves tossed the Pere Marquette around like a cork and as she drew abreast of the south pier, she slammed into the bottom of the lake with terrific force. The shock of the crash threw the sleeping men from their bunks and brought every crewman on deck to investigate. The steam-pipes were snapped and the ship immediately lost light, power and heat and drifted against the north pier. Clouds of escaping steam from the hold froze over the ship and the officers counted frantically to see if anyone was missing. The Pere Marquette’s officers discovered that everyone was accounted for except Michael Taft of Chicago, a coal passer. Steam had overcome him and scalded him to death, leaving a widow and two children to mourn him. Later when his body was recovered from the Pere Marquette’s hold, the rescuers discovered that it was literally cooked. Taft belonged to the Buffalo branch of the Firemen’s union and had shipped on the Pere Marquette only three days before. Two other coal passers, who were severely burnt were unconscious and could not give their names. They had managed to escape from the hold and were taken to the marine hospital in Ludington where they were given slim prospects of recovery. Several other crewmembers were scalded less severely. At daybreak on Sunday morning the stranded Pere Marquette lay about seventy feet north of the north pier and waves her pounded heavily, opening several huge holes in her forward quarter. She developed a heavy list to starboard and a big lump about amidships, giving the appearance of a sea serpent with a broken back. Moving ice completely surrounded her and since she had no steam it was bitterly cold on board. The men who had been scalded suffered agonizing pain during the eight hours that elapsed between the accident and the rescue. Rescuers and hundreds of interested spectators lined the shore and the rescuers had to decide how to get the men from the capsized ship. No small boat could survive on the mountainous seas that hurled tons of floating ice against the weather side of the ship, but quickly the training of the Ludington Lifesaving crew snapped into place. The rescue crew promptly brought out their Lyle gun and breeches buoy and successfully fired a shot line from their cannon on shore across the deck of the stranded steamer while securing one end of the cable firmly to the pier. Those on board made the line fast and hauled out the cable, and the lifesavers on shore made sure their end was secure. They sent the breeches buoy across and over the next three hours. One by one the lifesavers hauled 33 men and one corpse from the Pere Marquette and landed them safely on the pier. Captain Thompson was the last man to leave the Pere Marquette. As he took one last look around his crippled ship, he broke down, crying like a child. Will the Unlucky Pere Marquette 16 be Rescued? That evening after the rescue Railroad Superintendent Mercereau told a Detroit Free Press reporter that he had ordered pumps and tugs from Milwaukee, Manistee, and Bay City and they would attempt to raise the Pere Marquette as soon as soon as the weather improved. Marine men speculated that the Pere Marquette couldn’t be taken off the bar before the winter storms pounded her to pieces. Superintendent Mercereau shrugged. After all, the “unlucky” Pere Marquette had figured in numerous accidents. One involved the wreck of a load of cars that cost her owners about $30,000. The railroad company never highly prized the Pere Marquette 16 and did not seem to mourn her loss since both ship and cargo were fully insured, mostly with the Inland Lloyds. The company’s two steel car ferries made regular trips and had never had an accident. The day after the accident, the rescue vessels- pumps and tugs-tried to begin the rescue of the Pere Marquette, but the waves thundering from the southwest and the bitter cold prevented any work from being done that day. The Pere Marquette rested on the sand bottom in a bank of ice on the shore side, with the seas washing over her decks on the west side. The entire ship was encased in ice and with no smoke blowing from her stacks and no crew to bring her to life; she resembled a desolate ice mountain. But like all but one of her crew, the Pere Marquette lived to be rescued. The tugs and pumpers that the railroad had hired successfully freed her from the bar and she resumed her voyages on Lake Michigan. In 1907, the Hammermill Paper Company bought her, cut her down to a barge, named her the Harriet B, and used her to haul pulpwood. She was converted to a bulk freight steamer in 1918 and a barge in 1921, after beaching with heavy damage near Ludington. 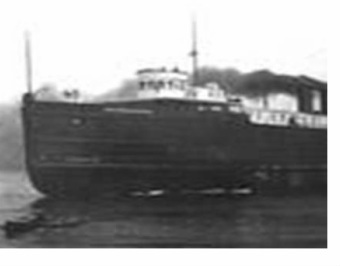 She foundered after being struck by the steamer Quincy A. Shaw near Two Harbors, Minnesota, in 1922. The Ludington Lifesaving crew moved on to other rescues with their Lyle Gun and breeches buoy. The breeches buoy was used for near shore rescues from about 1874 until 1939, when the Lighthouse Service transferred to the United States Coast Guard.